Warm greeting to everyone, how’s everyone’s week so far? I hope you are all enjoying your adventure with your little one. I had the privilege of taking the Assistants to Infancy course when I was pregnant with our first daughter E. for the first summer of our training. I was witnessing what I learnt in action when we did our prenatal timeline chart. I was eighteen weeks pregnant; I felt for the first time a little bubble with E. when she made her first interaction with me during my pregnancy. During our training, we learnt that the first six weeks of their life after they are born is very important to make a strong bond with your child. I used the first six weeks to have intimate time with her to guide her, care for her and talking to her about the new world around her. With my ethnic background as Asian, I have set in mind when I have my own children, I will be passing on the Mandarin language to my children while my husband, A. speak Cantonese to our children. Furthermore, during our training, we learnt to have intensive conversations with them. I have made a simple tune for each of my daughters. I started singing the song to them since my pregnancy. Furthermore, I found out after they were born that this is one of the tools I can use to calm them down. It helped assure them that they are safe and I am here for them and with them. When E. was about two months old. I decided to annunciate the Alphabets with their phonetic sounds. I saw E.’s face light up as she study intensively as I pronounce each sound. I can also saw E. was trying her hardest to communicate with me by moving her mouth and making cooing sound. We continued to communicate this way for the next couple months. On our Second Wedding Anniversary date when she was eight month old, she called “mama” looking at me intensively and with meaning. Some parents use sign language as a tool to communicate with their child. I also tried that with E. However, I suggest you follow your child’s developmental stage. For E., I introduced two signs to her, but she was making up her own way of communicating with me with her own consistent made up sign of her own. Furthermore, every time she was making those signs, she was telling me exactly what she want me to know by words. Therefore, I did not continue more sign language with her as she was showing me the urge to communicate with me starting with two words, then four words then it continue to evolve. She continues to learn how to speak in Mandarin, Cantonese and now English as she is enrolled in an English speaking Montessori preschool. It was amazing to see her continue to gain vocabularies each day. Moreover, she knows to switch to speak to me in Mandarin and Cantonese with A. 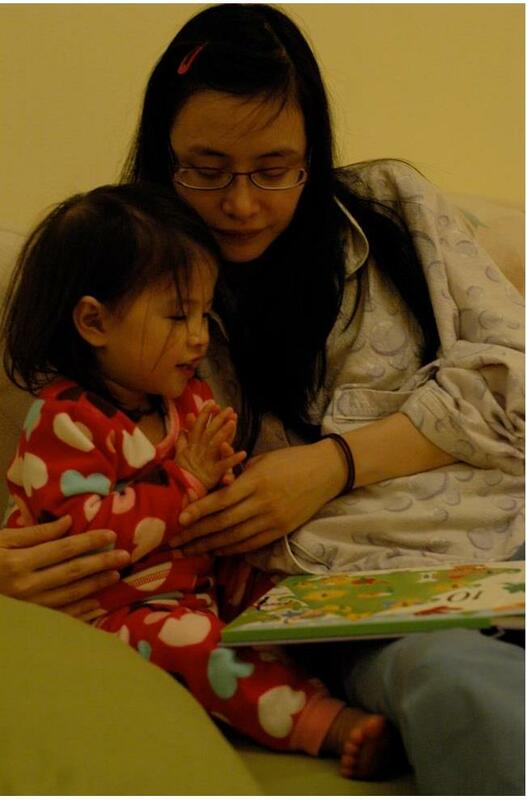 When H. was born, I continued to use the same method with her in her language development, but I have keep in mind to not to have any preconceive idea of how H. should be with her language development as she is another individual human being with her own set of developmental agenda. I also make sure, E. and H. has the equal rights to speak for themselves instead of having E. speak for H.
As the second child in the family, H. learns to speak from all of us including her own older sister E. She started communicating with us and sang songs like her sister. H. has the urge to be heard and her rights to be understood. 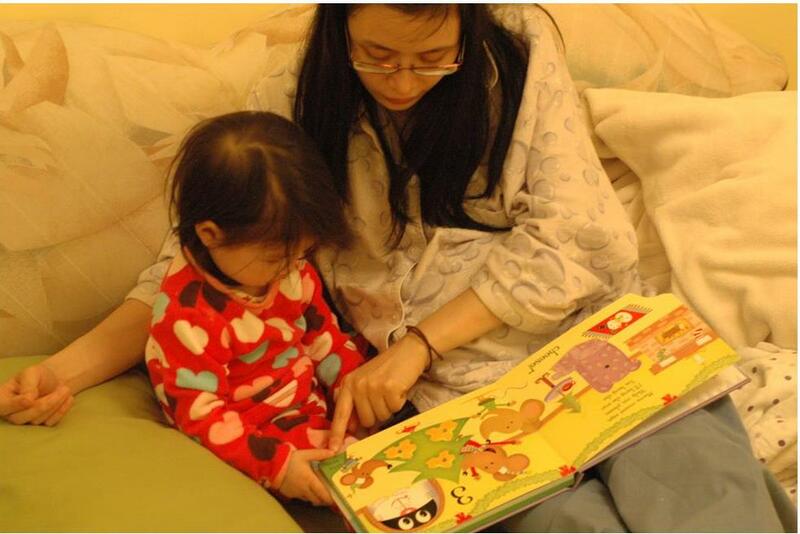 Therefore, her language skills took a roller coaster ride starting from eight months old. She also developed the skill of able to switching the language “’channel” in her own mind. For example, one sunny afternoon, we were at my sister in-law’s house having a great afternoon; one of the ladies who have not seen H. for over a year and she said to her “wow you have grown so much into a little beautiful girl”. H. was a year and four month old. She replied to her all on her own in English “thank you”. I was as surprised as everyone there as she was not formally introduce to the English language, but her absorbent mind like the sponge was helping to take in all the information around her world in everyway possible. As I have mentioned before and strongly believe; follow the child, your own child and take in all the information you gather, but see what your child can do in his and her own time as they are all uniquely created individuals. Happy sharing everyone.